The shelv system is adjustable in all angular directions and can be mounted on straight walls as well as on all roof angles. The shelving wall is attached to the corresponding wall with or without roof pitch and can be swivelled variably in all angle settings without the shelves losing their horizontal parallelism with the floor and/or ceiling. The shelf feet have joints and can be swivelled on both sides, so that they compensate for any inclines or unevenness in the floor and walls. Depending on requirements, the shelving can be mounted either standing on the floor or suspended from the ceiling. The construction is simple and inexpensive. It can be manufactured easily and in an environmentally friendly way, both as a one-off and in series production. Size, appearance and type of material allow a wide range of design options. 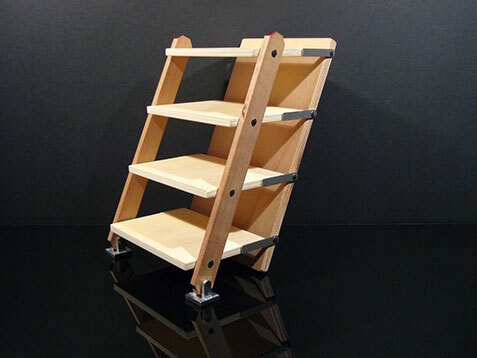 Therefore, this product can be manufactured as a low-cost storage shelf or as a high-quality designer shelf, depending on requirements. The self-assembly is carried out by the customer. No more expensive custom-made products will be necessary - the space and positioning problems in penthouses with sloping walls are solved. Since currently on the market no comparable product is available, it concerns with this development a gap in the market. The demand for such furniture is very high in apartments with pitched roofs, so I am firmly convinced that this shelving system can be marketed in large quantities. ©2018 Bluepatent. | All rights reserved.